One of the first signs that summer is about to show her sunshiny face in the garden is when the chives delight with beautiful purple blossoms. They are so lovely and cheerful when nothing else is growing well yet. More than that though, chive blossoms are delicious! They turn ordinary plain white vinegar into the most spectacular lavender onion flavored vinegar to use in salad dressings. And it is truly as simple as it gets. Step #1: Snip off blooming chive blossoms. 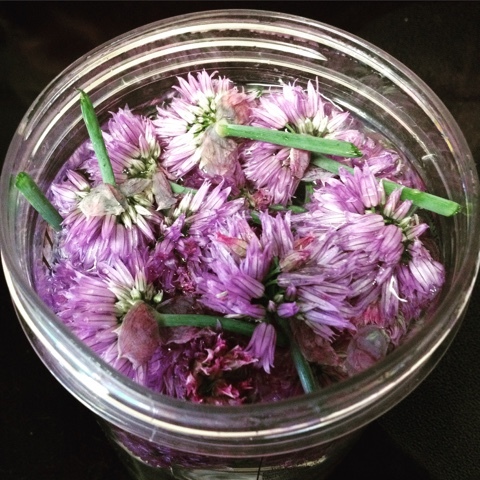 Step #2: Place chive blossoms in mason jar with white vinegar. Step #3: Wait a few days. A week tops. 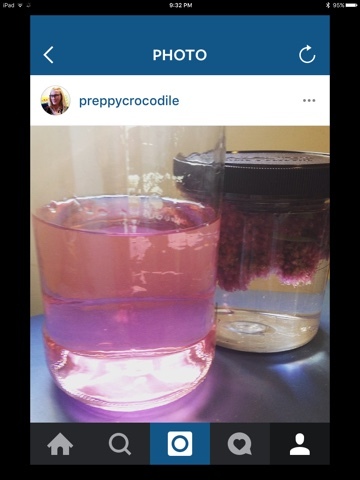 It will go from white to the most delightful shade of lavender and take on the most delicious oniony scent. Step #4: Strain off the chive blossoms and reserve the lavender chive blossom vinegar for summer salad dressings. Or gifts. It makes a lovely summer hostess gift! I hope you give this easy recipe a try this year! It's such a delicious and beautiful addition to your salads!